I've recently covered games like Heavy Gear and BattleTech quite in-depth. However I've also learned a lot about hex bases in the process. I figured it might be helpful if I'd put together this short but informative article sharing what I've learned along the way. Many of the most popular wargames use either round bases, or square bases. Games Workshop's Warhammer 40k for instance uses 25mm round beveled bases, and 40mm and 50mm round beveled bases. Privateer Press's Warmachine and Hordes both uses 30mm, 40mm, 50mm and I believe even on rare occasion 60mm round lipped display bases. However games like Warlord from Reaper, Games Workshop's Warhammer Fantasy Battles, and Mantic Games Kings of War all utilize square bases in the 20mm, 25mm and 40mm+ sizes. 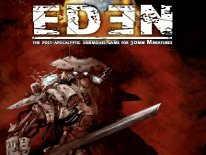 I don't really understand why, but I've noticed that the majority of the Medieval/Fantasy-genre games out there utilize square bases, where as most sci-fi/steampunk skirmish and wargaming titles have embraced round bases. The only games that I'm aware of that use hex bases are some of the space and aviation combat-driven games, and then War Rocket, Heavy Gear, CAV and BattleTech. I'm sure there are others, but the games that always came to mind first when I think of hex bases are BattleTech and Heavy Gear. I used to actually hate hex bases. Now that I've played games like BattleTech and Heavy Gear I now see why they utilize them. One thing I like most about them is that it makes figuring out a firing arc so much easier than it is on a round or square base. Heavy Gear utilizes 1-inch/25mm plastic flat topped hex bases, molded in black plastic. The Steel Warriors models from Red Shirt Games also come with 1-inch/25mm plastic flat bases, but slotted ones, also molded in black plastic. BattleTech doesn't have a specific dimension requirement, however the Iron Wind Metals (IWM) solid pewter hex bases, which I think are the best of all hex bases measure in at 1.25-inches/32mm. The IWM hex bases are more like a display quality base, because they're not flat topped. The model sits down into the base, as the outer beveled edges of the base are like walls for the interior. I can't say enough good stuff about the Iron Wind Metals bases, because if you end up with a top-heavy model, or one that just can't seem to balance very well due to an odd pose, the added weight of the all metal base usually helps out a lot to remedy the situation. When it comes to pinning a model to the base, and many Mecha models require this, nothing is going to work as well as that all metal hex base from IWM. I just finished up building about a dozen different Mechs over the past month, and I know this all from experience first-hand. The only problem with the Iron Wind Metals hex bases is that they're expensive, and I have a notion that price will probably be going up before long, because right now Tin is at an all time high. Tin is a major component in metal models too. So IF you like these bases you had better attempt to stock up sooner than later, because I'd bet anything that it won't be long before ALL companies dealing with metal models begin to announce price increases. I haven't heard anything yet pertaining to Iron Wind Metals in particular, so don't quote me as saying they will raise prices, because I don't know this for a fact. But I do know for a fact that Tin is at an all time high, and others are already beginning to announce price hikes because of it. So it's only logical to assume a company that deals strictly in metal models will be effected by the rising cost of Tin before long. It's only a matter of time. At present they sell 4x hex bases for $6 USD direct from their website, and the cheapest I've seen these on eBay is about $4.50 USD. Reaper also makes a smooth and a stone textured all metal hex base, and they sell 3x bases for $5.99. The Reaper bases are said to be 25mm in size, which makes them a 1-inch hex base. I also read on the Reaper forums for CAV that Reaper recently adjusted their prices on the new CAV models to reflect the new rising cost of Tin, and that they've also removed the metal bases from the new blister packs to combat the cost as well. It's not looking good for metal models in general at the moment. Thankfully all hope isn't lost yet. There is an inexpensive alternative. I stumbled upon the Chessex option as I browsed the Reaper CAV forums a few weeks back. Most people know Chessex as being the guys who make all the pretty dice, but what most people don't know is that the very same Chessex produce some bases too. They don't even list it on their website anymore, but they do sell 1 3/16ths of an inch/30mm plastic hex bases. These are just a hair smaller (1/16th of an inch smaller to be exact ) than the Iron Wind Metals bases, and these are also not the flat top variety, but the kind that the model sits down into as well just like the IWM bases. The only other difference is that the depth of the base walls is a wee bit shorter than the IWM base as well. All around this base is very close to the same size as the IWM base, but made out of a silver/gray plastic. 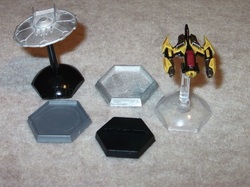 Here's the deal sealer, Chessex sells these bases for $15 delivered for 50 bases! Actually it's $10 for 50 bases, or $20 for 100 bases, and they charged me exact cost of US Priority Mail shipping, which was something like $5.19. So for $15 and some change I picked up 50x hex bases delivered right to my door. I've found the Chessex bases very useful for the smaller BattleTech models which aren't top heavy, and that don't require all of the weight of an all metal IWM base. For instance I've used these on my Urbanmech and Griffin Mech models, since both aren't very heavy at all. At a glance next to the IWM based models, you really can't tell the difference. Unless you look closely, the only giveaway is the depth of the base is a wee bit shorter on the Chessex base. Aside from that in use and on the board, there's no way to really tell it's any different unless you pick the model up and handle it. The weight difference is the only other dead giveaway once it's painted and has basing materials on it. A 1-inch plastic hex base from the Steel Warriors set fits perfectly down inside of the Chessex base too, but is a hair away from being able to do the same with the IWM base, which shows that the walls of the Chessex base are not only a little shorter, but a little thinner as well. You don't have to be into just BattleTech to make use of these bases either. Since a variety of new CAV models have been released (as recently as a couple of weeks ago), and since they no longer include bases, the Chessex and IWM bases will no doubt be in even higher demand. The new CAV rules are also in beta at the moment, and can be downloaded from the Reaper forums for CAV. So I see CAV making a comeback very soon. I'm sure once this article goes live I'll receive some emails from others telling me about other hex bases I might have missed, because I'm certain I overlooked some. For instance I'm aware of Litko and all of the basing options he has to offer, but he's never responded to any of my inquiries, so there's not a lot I can say first-hand about those options. All I know is that he makes a variety of bases, in a ton of different materials which you can choose from at a reasonable cost. I was leaning towards the Litko option too, but no one would ever respond to any of my inquiries, so I took my business elsewhere to Chessex. I'm also aware of Gale Force 9 offering magnetic hex bases, but the whole magnetic base thing never interested me at all. I'm not about to paint my models up all nice, and then let a magnet hold my models in place in some metal toolbox. No way. No how. I prefer foam trays and proper storage and delivery options for my models like the Army Transports and the new Portable Warfare bags. So the magnetic angle is pointless if you ask me. That's the item number exactly how it appears on my invoice. Just inform them of how many you want 50x or 100x at a time. My only complaint about the Chessex bases is that out of 50x bases, a small percentage of the bases were miscast, or melted-looking around an edge or two. However I did inform them of the issue and they were kind enough to offer to send me replacements. So if you do order any, just be sure to look them all over and report any issues, as they'll take care of you if there's any. They responded pretty quick to my complaint, so I'd give them high marks for having good customer service. I'm also a little disappointed that I wasn't able to find any options in the way of scenic hex bases out there to cover. None of the major players who make scenic bases offer them at present. I'm attempting to assist in remedying that. At the moment I'm actually speaking to a very well known company that produces scenic bases, and I'm educating them on hex bases, plus tossing some ideas their way as to what I think might look good in the way of scenic hex bases. So the future is looking bright for scenic hex bases. Stay tuned for more on that front. At present the immediate future for the cost of Tin isn't looking so great, so stock up now if you want the best hex bases that money can buy from IWM, and if you're in a pinch and can't afford the IWM bases to begin with, the option from Chessex really can't be beat.